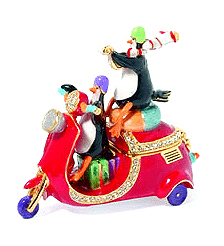 Cassie posted the jewel box back in February 2007, but I just ran across a penguin ornament on eBay and discovered that these little guys are from the “Christmas Eve” line of Penguins from Department 56. And their goofy design definitely suggest a “Wallace and Gromit” influence. 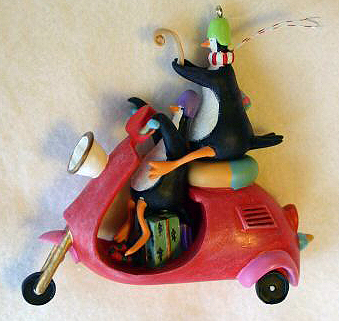 (BTW, Has there been a scooter in a Wallace & Gromit feature?) Well, a short perusal on the web didn’t yield a ready source for the ornaments, but at least you penguin lovers out there will know they exist. And there may be other cuteness out there. Let us know if you find them! This entry was posted in Holiday by Tracy. Bookmark the permalink. I bought the ornament last year at Sleighbells in Sherwood. So cute!